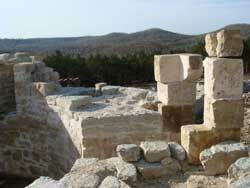 The Ozark Medieval Fortress ceased operation in 2011. The Ozark Medieval Fortress in Lead Hill, AR is a unique, on-going project being built using the same techniques that 13th-century builders and laborers used to build real buildings of that time period, offering a first-hand glimpse into the history of fortress construction for an activity that is all at once immersive and educational. The construction will continue for 20 years, the time that was required to build such a fortress in the Middle Ages. The castle is built to scale and includes a working drawbridge, 24 foot high, six foot thick walls, 60-foot towers and everything else you would find in a real medieval castle. 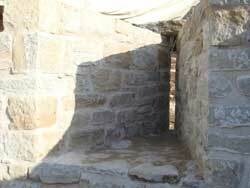 It is being built using genuine methods from the 13th century validated by experts in the field. While being safety conscious, the castle is built using materials available in the area such as felled trees and quarried stones. It is both an educational and pleasurable experience for the whole family as it brings history to life. Workers and craftsman, on-site will be available to answer questions about their work and the castle construction. Your family will be transported, through the beautiful Arkansas hills and deep into the forest, back to the Middle Ages and into the year 1000. 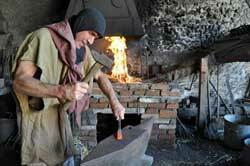 You will interact with artisans, stone carvers, blacksmith and other workers dressed in period costumes in this living history project.